I love to make a good pizza, don’t you? The best ones are made on a thin base and topped with ingredients full of flavors, like this pizza! It’s my kind of pizza and I’m so excited to share it with you. This is how it comes together: first up is the vinaigrette with a lemony touch, it’s fresh and light and adds flavor to this pizza. Then it’s topped with cheese, minced lamb and vegetables, finally served with a garlic yogurt sauce and pomegranate seeds. 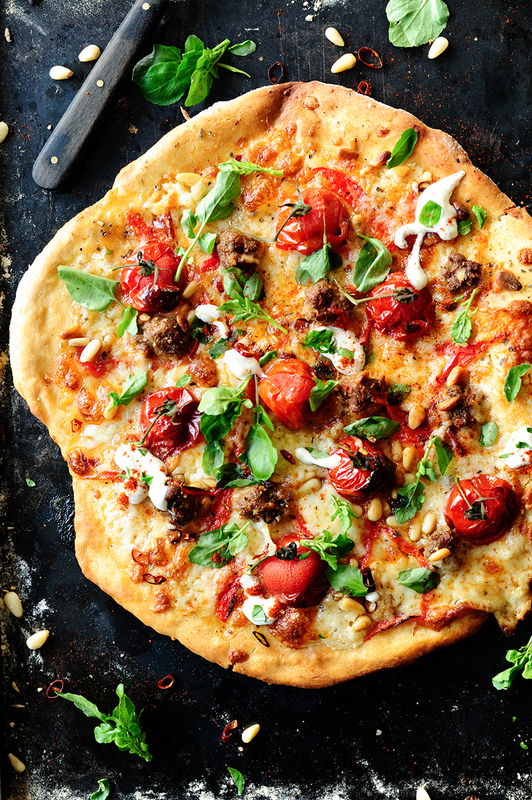 It’s pretty much just perfection, but in all seriousness, I know you’ll love this pizza. Combine yeast with water and honey, sift the flour and add milk, oil and salt. Knead the dough for 10 minutes in your mixer. Cover and leave for 2 hours to rise. Combine the lamb mince with spices and form small balls. Divide the pizza dough into two and roll out. Transfer to a floured baking sheet and spread with the vinaigrette. Add mozzarella and goat cheese, meatballs, cherry tomatoes and bell pepper and top with pine nuts. Bake for 5-10 minutes at 250°C. In the meantime combine all ingredients for the garlic sauce. 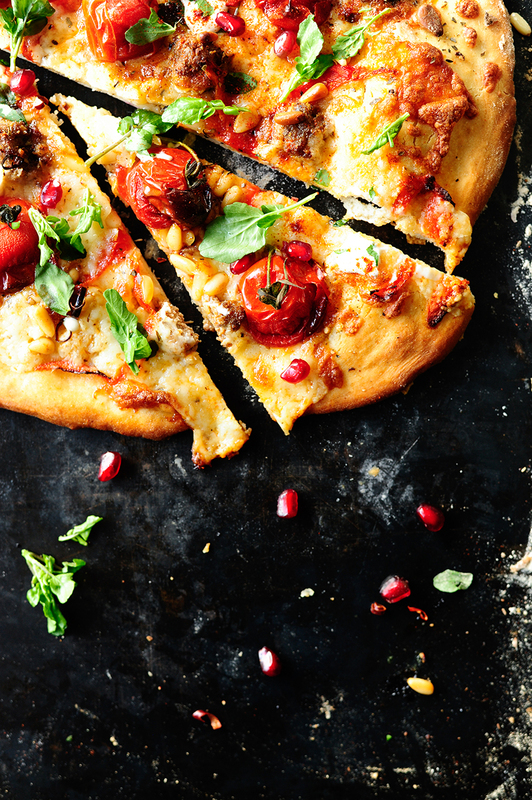 Remove the pizza from the oven, top with pomegranate seeds and garlic sauce. Eat! I tried your recipe yesterday, and oh my. It was way more delicious than I first expected! I love the mix of ingredients and how they go super well together. Love it, love it!